So i bought an untested original Famicom for pretty cheap, that was bought in a lot sell by the seller, to use in a personal project, and im trying to see if it works. They sent a copy of Dragon Quest III with it (which was nice of them), but it doesn't seem to work. I'm using the NES-003 RF adapter, and my tv (old plasma) is set to channel 96 (thank you "cable" mode). Power adapter is pin-negative, 9v, 850mA DC. When i turn on the console, the screen is "blank"; that is, it outputs to the TV (static is replaced), but it's just a black(ish) screen. I'm assuming this is the behavior of a system with no cartridge? I've cleaned and inspected both the cartridge and header pins, and nothing seems awry. Looking inside the unit there's nothing out of the ordinary looking either (though i didn't inspect the board's topside). So my question is: is it the cartridge or the FAMICOM, and how can i tell? any pictures? check the cables between RF power unit and main board . 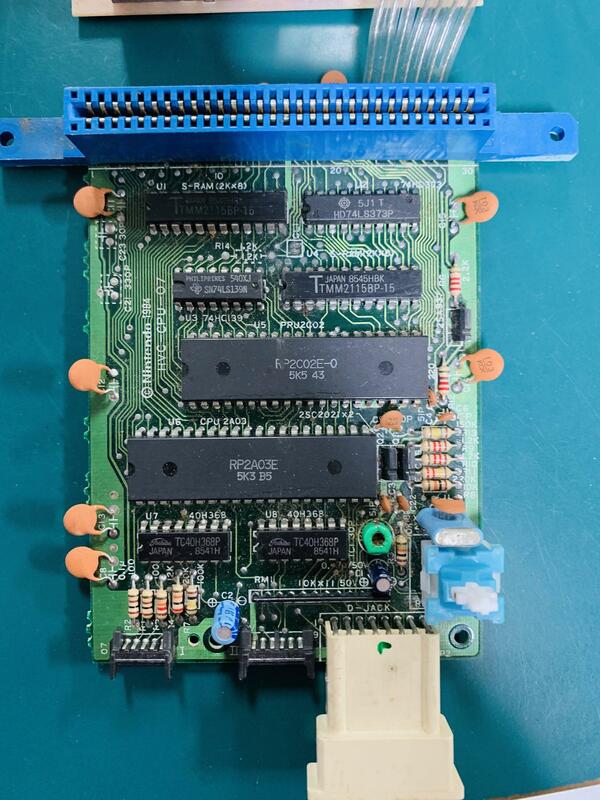 Try cleaning the cartridge pins with rubbing alcohol (contact cleaner should work fine too). I used an general purpose alcohol wipe (for electronics and glasses) on both the console and game contacts with no luck. Cleaned them fairly good though. What do you mean exactly? As in check the internal cabling? I don't think it's a power issue (wouldn't it not output anything at all if the console wasn't powered? The screen is static when the system is off). Nothing looks out of the ordinary with it, inside and out, though i could give the internals a more thorough look. I'll take pictures of the board when I'm home. 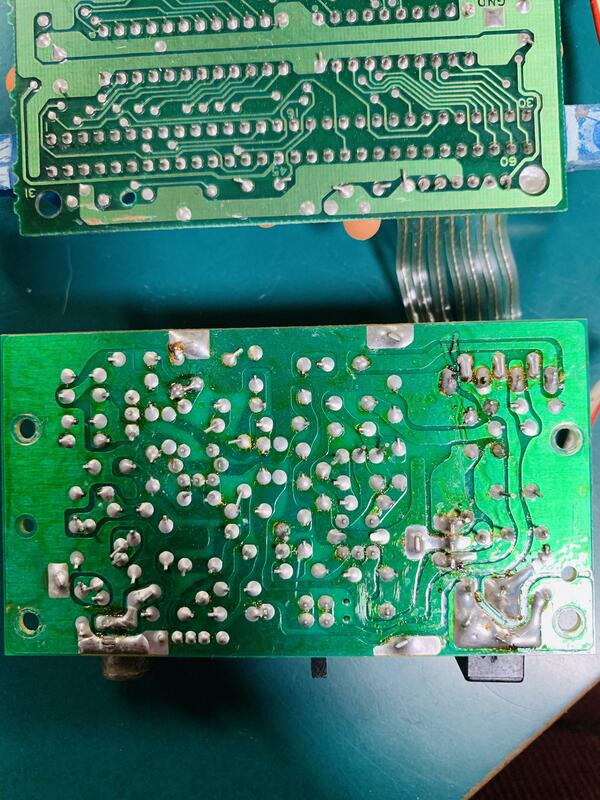 you will get a solid black screen even if video signal from main board and RF power board is disconnected, so get multi-meter and check it, also check if you getting good 5V out of 7805, you you getting lower then about 4.5V that might be an issue too . There is another possibility, bad RAM chips or CPU/PPU. I would, but, i can't find it. I'll keep looking around for a proper image so i know what to test. Edit 1: I found it, and it's got the right voltage. 5v on one pin, 9v on another (using a 9v supply) and 0v on the center (ground). Edit 2: whilst plugged in, none of the chips on board heat up. Cartridge problem? Edit 3: A friend informed me that the Famicom will output mic audio to the TV when a cartridge is inserted, and it works! So at least audio is working. Seeing as audio works but theres no sound from the game, does this mean it's the cartridge? Or could something else still be bad? You could always just buy a $2 cartridge from ebay. Or even another copy of Dragon Quest III. Those are really cheap. I have TENNIS being shipped in from Japan, but it won't be here for a couple of weeks. I'm assuming this is the behavior of a system with no cartridge? The exact behaviour varies for each Famicom. This could be many things. A partly working AC-adapters is a common problem. 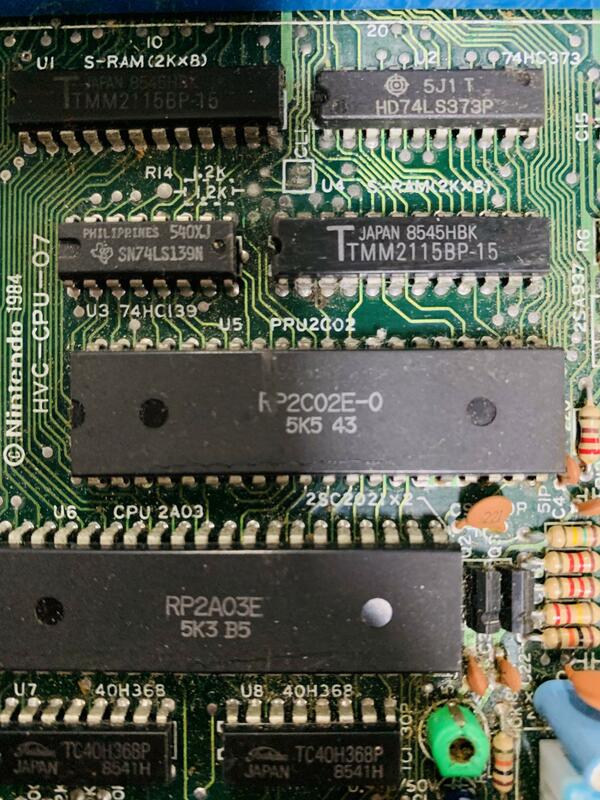 Oxidated pins on cartridge and/or console is another. 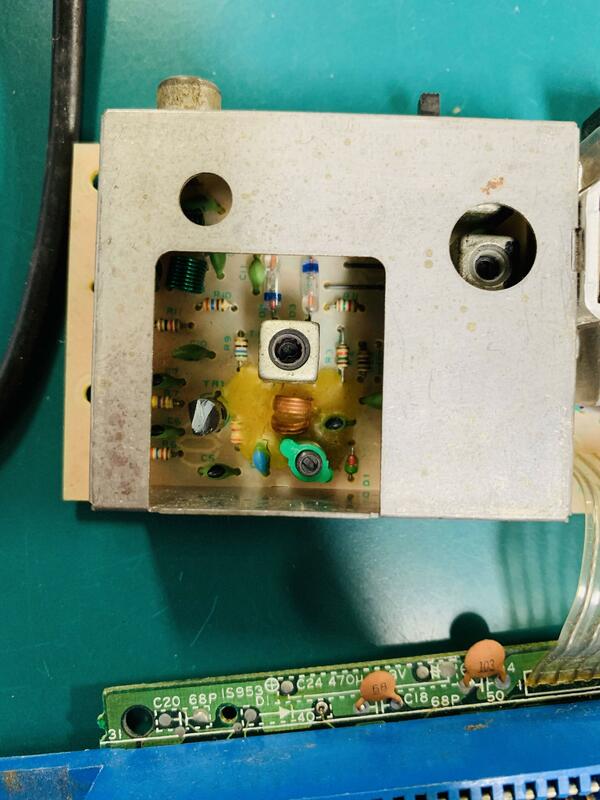 That means that the the mic works, the audio line is connected to the RF-board and that the audio pins on the cartridge are bridging correctly. It doesn't mean that the CPU and APU are working though. Yeah trying other games to rule out the cartridge is your best bet I think. So Tennis arrived, and the cartridge did not work. So it seems to be something with the console (CPU, PPU, SRAM). Would that be considered corroded? 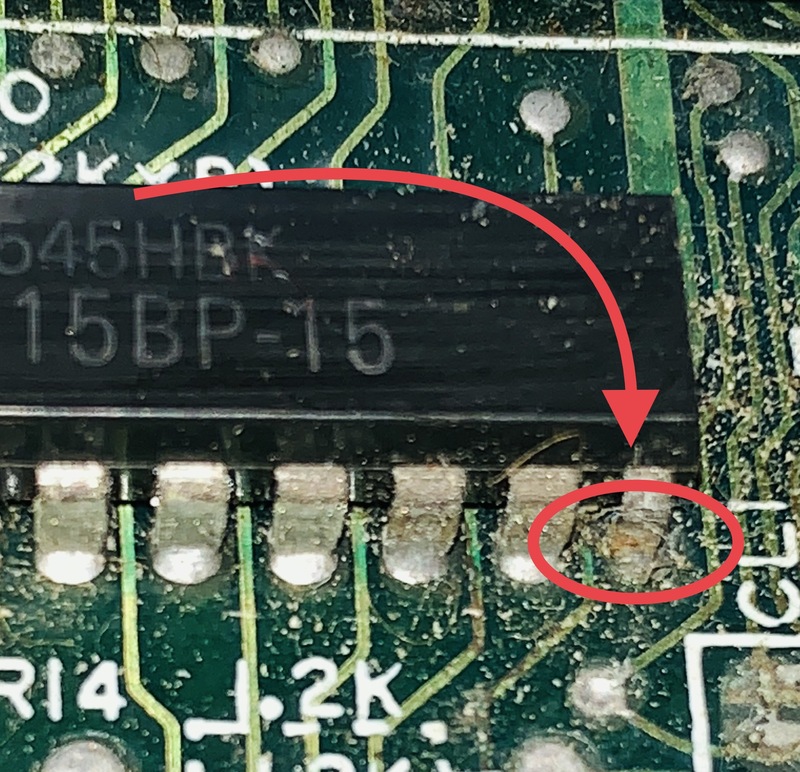 It looks a bit like "rust" on this one pin. Wondering if this↗︎ is my issue? If it is SRAM, would this↗︎ work? It's a 6116 (2Kx8 16Kb) 24-DIP through-hole mounted SRAM chip. I feel like this would be a suitable replacement, but i can't find a spec sheet on the one in the system to compare. 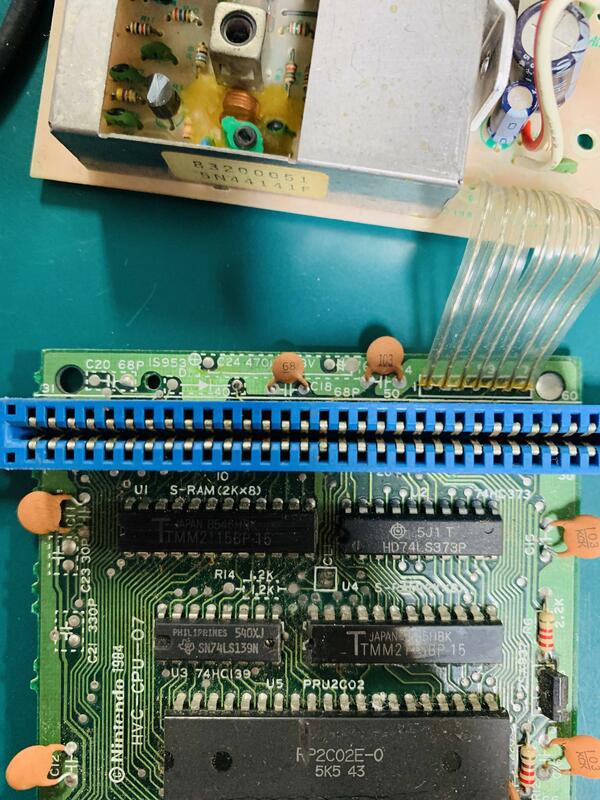 Edit 3: I found a spec sheet on one of the SRAMs used in another original FAMICOMs (not mine but same system; different manufacturers based on production date i assume) and they're identical except for the fact the IDT chip has a faster response time (15ns vs 150ns). 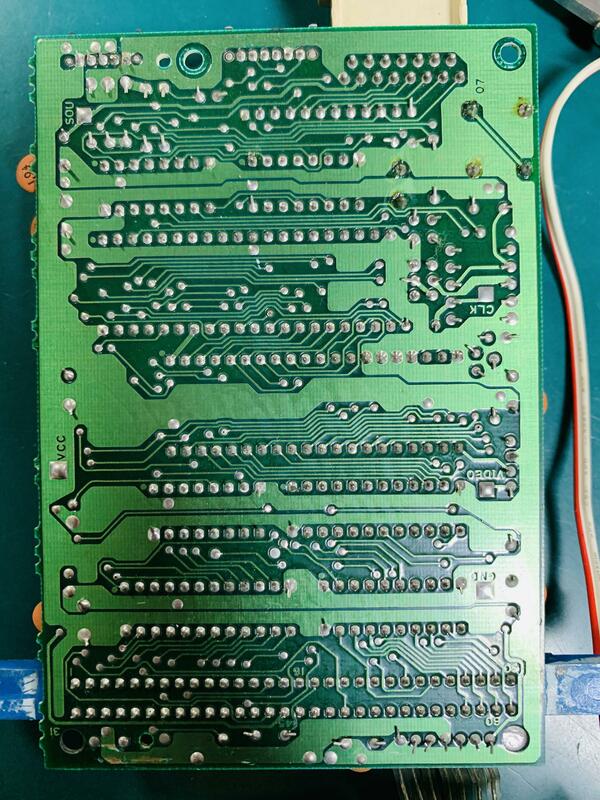 Clean PCB with IPA and reflow that chip. Looks like there is water damage. You should replace plastic trimmer(that green part around XTAL ), 22-27pF ceramic capacitor will do the job, if you don't have trimmer. And, yes, need good cleaning with IPA. Could you perhaps circle in the image what needs replaced, and provide a part number or part specification if possible?